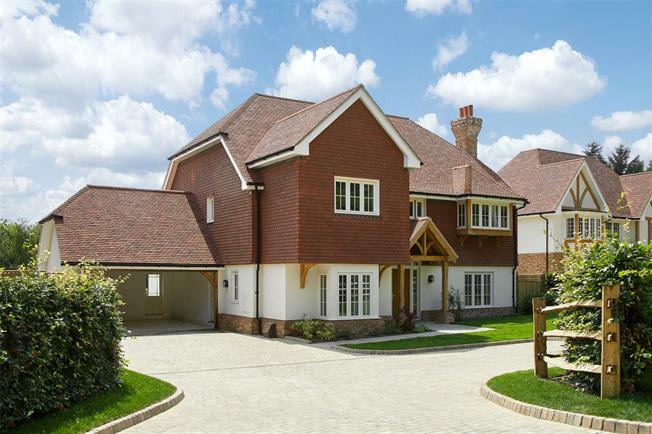 5 Bedroom Detached House For Sale in Wadhurst, East Sussex for Asking Price £1,395,000. The external elevations are a neutral render to the lower level and a hanging tile to first floor with an oak entrance canopy, reflecting the beauty of the Sussex style heritage. The attached barn style garage has ample room for two cars, whilst the private driveway is convenient for visitors. The spacious entrance hall leads to the triple aspect sitting room with fireplace and dining area. Double doors open to the vast kitchen/ dining/family room allowing plenty of room for sumptuous entertaining leading to the garden through bi-fold doors. The sitting area with glass lantern overhead allows the room to be flooded with natural light. The kitchen has integrated Siemens appliances, island area and a separate utility room providing everything required for modern day living. Double doors lead back to the entrance hall with access to the downstairs cloakroom, under stairs cupboard and study. The staircase, with oak handrail and spindles, leads to the spacious landing. Upstairs, the master bedroom suite has a luxurious walk through dressing area, leading to the ensuite bathroom with bath and separate walk in shower. Bedroom two also benefits from an ensuite shower room. There are three further double bedrooms and a family bathroom. Outside, the paved terrace can host outdoor entertaining and the garden is beautifully landscaped. Wadhurst Place itself is set within 18 acres of parkland and benefits from amazing views over the Weald.